THE WORDS SUMMER AND BARBEQUE go hand in hand. 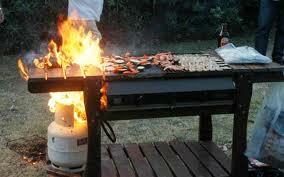 But a grill-caused fire can make your summer gathering memorable for all the wrong reasons. East Pierce Fire & Rescue offers these safety tips to consider while planning your summer grilling festivities. Regardless of the type of grill you're using, give it lots of space - at least 10 feet of clearance from any structure, trees and shrubs. Make sure the grill is used in a safe place, where kids and pets won't touch or bump into it. Remember, grills stay hot after you finish cooking. Periodically clean grease and other debris from the grill. Be sure to look for rust or other signs of deterioration. Avoid wearing loose clothing that might catch fire while you're cooking. Store propane tanks outdoors and never near the grill or any other heat source, and never store or transport them in your car’s trunk. Avoid using a propane barbecue grill on a terrace, balcony or roof. Because charcoal produces carbon monoxide (CO) when burned, charcol grills pose a serious poisoning threat. CO is a colorless, odorless and tasteless gas that can accumulate to toxic levels in closed environments. Place grills with at least 10 feet of clearance from any structure, and have a water source immediately nearby, such as a hose or 4 gallons of water. Be careful not to spill any fluid on yourself, and stand back when igniting the grill. Keep the charcoal lighter fluid container at a safe distance from the grill.